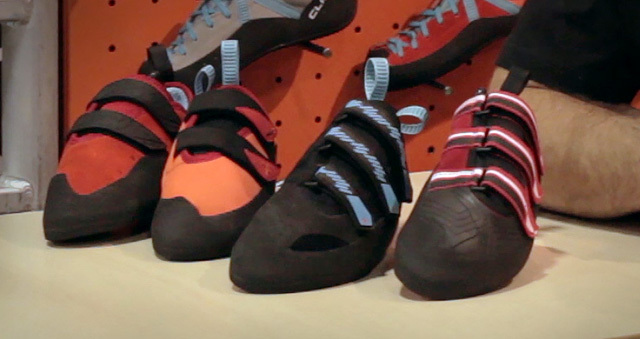 The Arakys (Uh-rack-ease) crag shoe is designed to go easily from the crag, to the bar, to work, and back to the crag. They have a fold-down heel that makes it fast and easy to switch between projects at the crag or boulder field. The closure system gets set once, and then it’s a quick and easy on/off clip into the future. 270 grams per shoe for US size 9. Feb, 2016, $150. Want more shoe details? Hiking Finland’s blogpost dives further into the Acrux and Arakys. Arc’teryx also updated their popular minimalist Cierzo (See-air-zo) alpine pack to increase durability by moving to a tougher ripstop fabric on the sides, adding padding on the straps, and creating a compression cord system with almost limitless configuration options. Due to the additional features, the 28 L pack increased slightly in weight to 550 grams. Feb, 2016, $119. Asana is putting out new colors for the PRism pads released last year. Instead of thinking of the colors as red, green, blue, and black, Jamey (Asana founder) says his inspiration came from fire, earth, water, and stone. $175 – $215 depending on size. 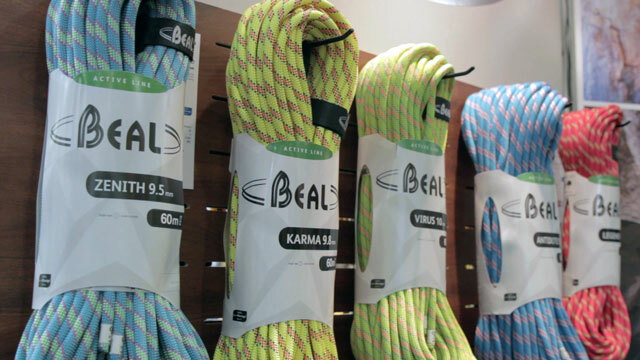 Beal’s Active Line (aka: no dry treatment) ropes feature completely new designs for 2016: 10.2 mm Antidote, 10.0 mm Virus, 9.8 mm Karma, 9.5 mm Zenith (the only non-treated rope below 60 g/m) and the Legend 8.3 mm, rated as a twin/half rope. Depending on length the prices range from $119 – 199.95.
pictured, red, is the ladies version (also comes in lt gray), men’s are bright blue and dk gray. 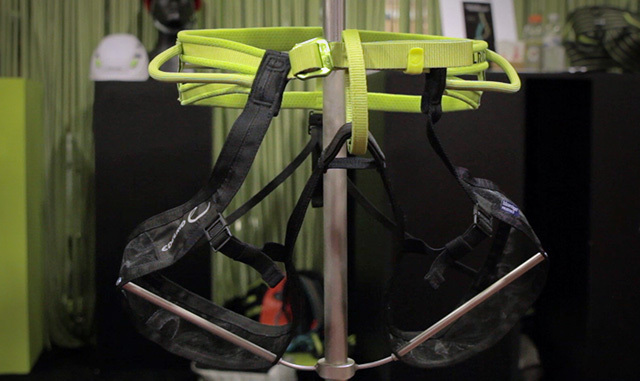 In 2016 BD’s entire helmet, belay device, carabiner and quickdraw lines will have completely revamped colors. Most notably: black carabiners, some with black wire gates. You’ll also notice updated dog-bones widths on each quickdraw to be more in-line with their intended use (ex: Positron dog-bone is now beefy). You’ll see green, blue, purple, red, and yellow will be the go-to colors along with black to make the colors pop. Prices are unchanged. Also worth noting: all BD climbing hardware is now (as of this writing, in Aug. 2015) made, assembled, and anodized in Salt Lake City. A new iteration of the Acro climbing shoe is coming with a narrower fit for both the high and low volume models (models based on volume vs gender stereotypes). Butora also removed the heel padding allowing for a more sensitive feel. Fully lined leather, 3-D injection ABS midsole to keep the downturned shape and a massive perforated rubber toe-patch for toe-hooks. The Acro also incorporates open cell foam padding on the tongue for comfort. Made for bouldering and steep sport climbing; think 5.12 and up. Same price as the previous model, coming out in October 2015, at $154. the Titan will also available in bright green, light gray, and white. The Titan, a new hardshell helmet was designed to be robust for when you need extra durability. The interior sports a suspended mesh cradle to increase breathability and accommodate a large range of head shapes. The cradle is removable, washable, and replaceable. The rear dial adjustment folds up and hides in the helmet for storage. Two sizes cover the full spectrum. $54.95. The totally new Oval XL carabiner (pictured, right), is bigger, 1 gram lighter and 4kN stronger than their current oval offering (left). If you get super technical it’s not really a “true” oval in that the shape has just a hint of D to shift forces to the spine to increase strength but it’ll still act like an oval and hold double nut sets with ease. Solid gate: $11.95. Non-locking and Locking options vary, $14.95 – $24.95. Shoutout to the Alpine Start for the photo that was way better than ours. Boa Eco 9.8 mm rope (called the Parrot in Europe) is made from leftover bobbins of fiber that are smaller than the 1000m+ lengths of rope Edelrid normally creates. Because these are leftover bobbins from various ropes, all of the ropes have completely unique pattners. Edelrid is now saving perfectly good thread from the recycling bin. Note: Although it may seem like Edelrid is making more money by turning these leftover threads into ropes, it actually takes significantly more manual work to move the leftover bobbins and make smaller batches of rope (60 m – 200 m lengths) so the price is comparable to Edelrid’s other Thermo-treated ropes: 60m is $149.95 and 70m is $169.95. the smallness of this harness is not captured in the picture! The Finn Light is a very small laminated kids harness that can be worn as soon as the waist belt fits around the kiddo (and it never hurts to double check the size chart). There is no weight maximum. There are also extra features to help the child can put on the harness on correctly by themselves, like the leg loops are banded together to ensure they won’t tangle and the easy glide buckles are kid adjustable. The Finn Light also takes into consideration the size proportions of children and isn’t just a “shrunk” version of an adult harness. Spring 2016, $42.95. New in the Spirit range: Elite 7.8, Performance 9.2, Power 10.0, Nexus 9.6. All of the Spirit line ropes have UniCore technology that bonds the sheath to the core. They’re also EverDry treated, which means the sheath is dry treated but the core is not. The Nexus 9.6 and Power 10.0 incorporate a spiral core that helps keep the rope nice and round for its entire life. 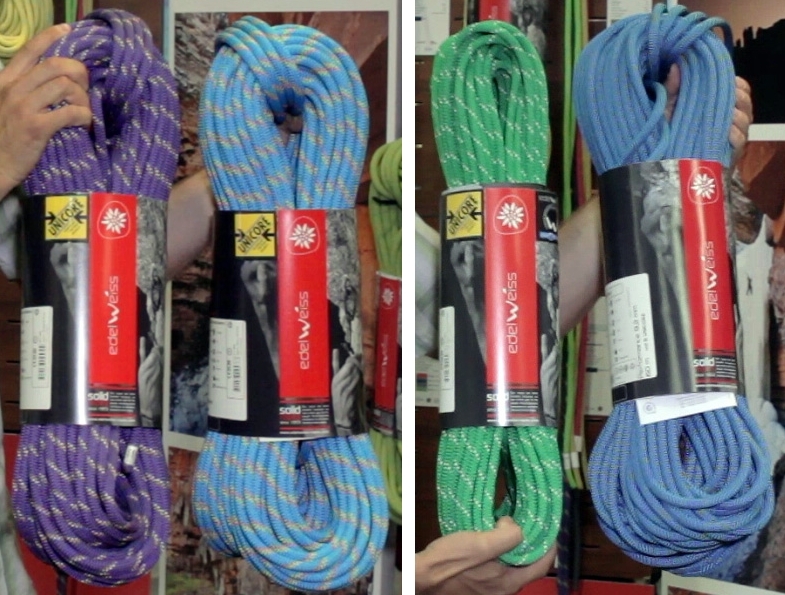 Prices all over the board depending on size, but the highest is the 9.2 Performance Unicore, Sheath and core treatment 90 meters, 2 ropes, for $389.95. The Dart is an all-around harness with 4 buckles for maximum adjustability. Web Core technology means it has continuous laser-cut flat webbing that adds strength and comfort and keeps the harness light and thin. Since the materials are not laminated together (they’re sewn), it can come at an aggressive price of $49.95 compared to the laminated harnesses with Web Core technology. 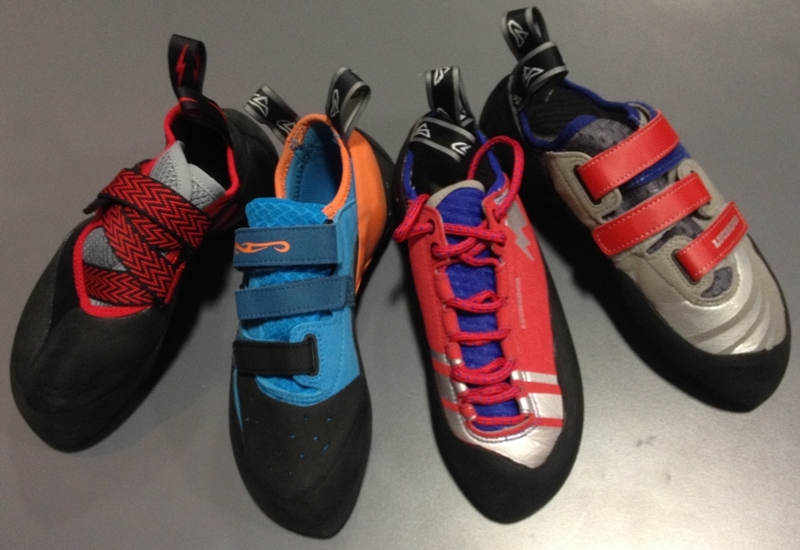 A new release, is the Evolv Agro (unisex) climbing shoe. It’s an aptly named super aggressive, very downturned, flexible and soft shoe for maximum sensitivity. Spring/Summer 2016. The Shaman is also getting an update. Think everything the old Shaman was but with improvements: lots of flex in the mid sole for sensitivity while maintaining powerful edging with a very firm forefoot. The Shaman also gets an increased slope the front of the toe box and more trax rubber on the toe-cap. Spring/Summer 2016. Also new (and not pictured) is the Raptor (men’s) and Raven (women’s). The focus here will be on entry-level comfort and go for $99. The Quantum started when the the famous Alex and Thomas Huber brothers approached 5.10 to design a shoe they felt was missing. The biggest difference between the Quantum and other shoes is that it has a wider toe box in addition to its downturned shape. It also includes barrel lacing for faster adjustability. The intention was to have a shoe with maximum performance for top-end climbing that could be worn all day long. 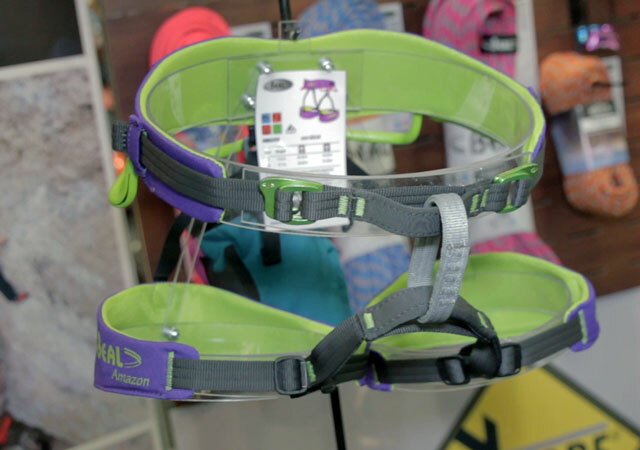 Grivel has also created a stand-alone back-support accessory called the Shield that can fit onto virtually every climbing harness. It reduces back pain and will help anybody who spends a significant amount of time hanging in a harness—big wallers, bolters, and route-setters should take particular note. $35 sold separately, and 50% less when you buy it as a Grivel harness combo. The Angler quickdraw has a high-end solid gate carabiner on top of a beefy draw. But the interesting part is the rope side of the quickdraw: the bottom wiregate ‘biner has a very aggressively angled nose for easy clipping. This is also why Mad Rock added a deflector fin above the gate – to move the rope away from the gate to stop an accidental unclip (during a fall / if accidentally back-clipped). There is also a thumb ledge on the spine to improve handling. Spring 2016. Price TBD. The Wall Lite carabiner weighs 23 grams and is almost identical in size to the 27 gram Wall carabiner. The difference is the Wall Lite has more advanced hot forging to move metal where it counts. This will be available in a rack pack and also come in a few different quickdraw configurations. Feb 2016, price TBD. Mammut also come out with a personal anchor system, the anchor chain, that incorporates multiple large and small dyneema loops. 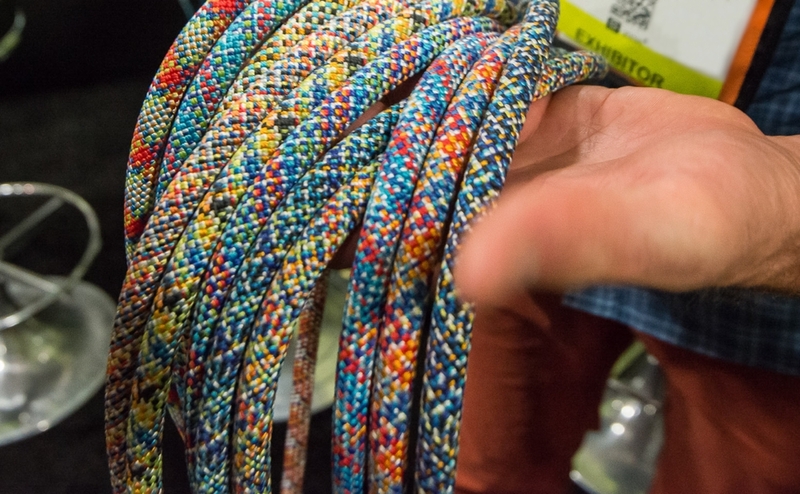 The 9.1 mm Airliner is a tried and true rope used by lots of climbing teams and athletes, but it is now coming in a double-dry bi-pattern option for 2016. 60, 70, 80 meter lengths. Harnesses, including Misty’s best-selling Cadillac harness, received color updates and more importantly they got some behind-the-scenes, in-house process improvements that will equate to faster delivery times. Organic has adopted the Spot pad from Pusher/Revolution/Cordless; in addition to buying the rights for the pad/pack, Organic has put their own twist on it. They have increased the zipper pocket on the front flap, incorporated their own buckles, and are now offering the massive assortment of colors that Organic is known for. Not only is the pad assembled entirely in the US, all of the materials and foam are all US sourced, too. Great for sport and trad climbing as a crag bag to provide a cush launch pad, and easily move gear to your next line with the two beefy side-handles and rope tie-in points. $150. The big news for Petzl is their crampon system is going modular. In the near future you’ll be able to buy any of the toe-plates and heel plates separately in addition to any of the complete crampons. The linkage bar is also improved to cover all sizes that previously required two different (small/large) linkage bars. The new anti-ball plates will be dual-density so they’ll stay rigid against the crampon and also have a rebounding feature to throw off the nasty afternoon glop. Modified the Elia to increase the height of the ponytail cutout along with a new webbing adjustment to fit a larger variety of noggins. Reduced the weight of the AM’D and William carabiners with a hot-forged I-beam construction. Added more pockets and padding to their small multi-pitch daypack, the Bug. The entire endurance line of Roca Ropes will incorporate a 1 over 1 braiding pattern that makes the ropes incredibly durable. When we went to the Fixe/Roca booth we were given a demonstration of a knife running over and over the rope with no discernible impact on the sheath AND Kevin had been giving this demonstration with the same rope the entire show. The Drago is a modern slipper with a single velcro closure. It has a huge connected rubber toe cap that comes up and over the dorsal portion of the foot for compression moves and toe-scumming. Heinz Mariacher designed it as a show piece of what a modern climbing shoe could be regardless of price or marketability, thus the $200 price. Originally Scarpa planned a limited release of the Drago with only 1,000 pairs globally so we’ll see if it hits the US market, as all 1,000 pairs sold out at the European show a few weeks prior to the US show. July 2016, $200. The Helix is a classic Scarpa shoe with improved technical specs and updated cosmetics. The lacing now goes further down to the toe for more precise fit, the leather tongue has been replaced with a cushioned tongue for more comfort, and the heel is less bulky than the previous version. The new Helix sole also receives an upgrade to Vibram XS Edge rubber. Price remains the same at $99.99. The Origin is a shoe that has a rich luxurious feel and is suited for new climbers without screaming “NEWBIE.” You can get comfort and all-day performance with this affordable entry into handmade Italian climbing shoes. The Origin looks like a $120 shoe but you can get ’em Spring, 2016 for $89.99. Shoe peep show. No details yet. You’ll have to wait for their Kickstarter campaign! Trango also updated their Crag Pack to include a smaller size for shorter climbers, same $99 price. Wild Country has improved the usability of the New Friends. 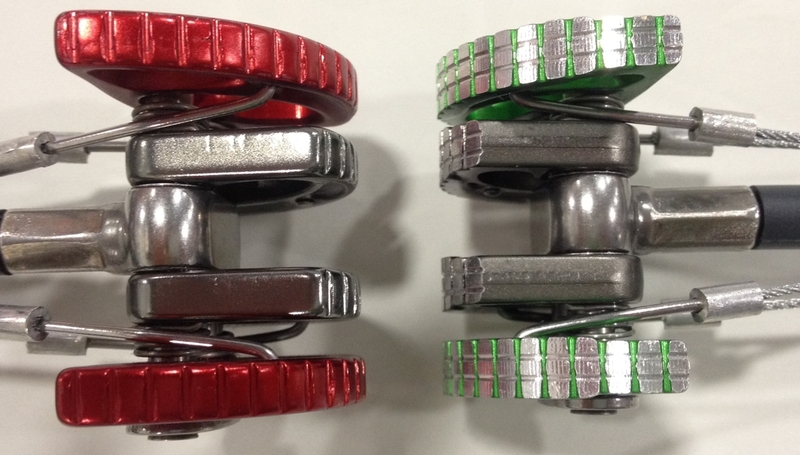 These dual-axel puppies are now color coordinated to match what is seen as the industry standard (Camalot colors). The size range will also match BD C4’s. The new Friends have hollow axles to decrease weight and actually increase strength. The hot-forged lobes are also wider and less prone to walking with the contact surface removed of anodizing for additional bite. Extendable slings allow for a lighter rack and shorter triggers will be nice for smaller hands and add less fatigue when placing. Sizes .5 – 4 are $64.95 – $89.95 (larger/smaller sizes not available, yet). The Alpine Start – These Canadians do one of the best show overviews as they cover climbing clothes, hardware, backpacks, and footwear. 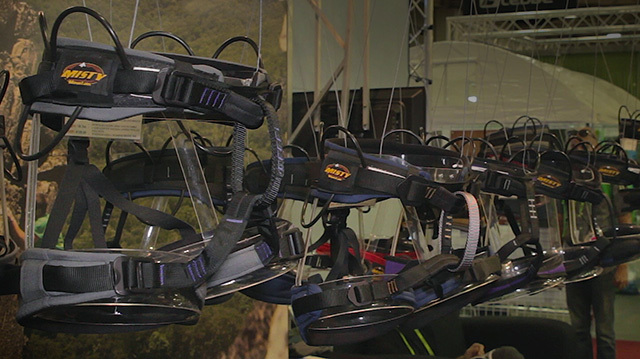 Hiking Finland – new gear from the Outdoor Friedrichshafen show in Germany. BMC – shows off gear from the German show including technical gear, and they have a bunch of videos. Gear Coop – shoes, packs, socks, water bottles, climbing gear, they cover a plethora of categories! Gear Caster – Amy puts out posts with enviable speed, and covers everything outdoor related. Gear Institute – Already has awards out for gear coming next year, see what attracted their eye. Splitter Choss – Read another opinion of the gear covered above and see some gear we skipped over like approach shoes and packs. And great overview of the rock stuff; I tend to miss things not associated with snow and ice! Thanks for the overview and the stickers (just received them). Great work!